My lovely friend Sylvia has been at it again! Sending me presents, and not just any presents, but ones that had a lot of thought put into them. Just take a look. There are some of my favourite Ghiradelli dark chocolates with the mint centres. We shared some when we were together in June. There’s a fridge magnet of the stunning Pennsylvania Grand Canyon that we visited together. Then there are four reels of Sulky Blendables. I really love using these threads and Sylvia must have read my blog where I was speaking about them and saying I wish I had more colours and so she bought me some. That’s is so kind of you Sylvia. Thank you so much! But that’s not all! Some hand and body lotion called “Gypsy Woman” – do you think she’s trying to tell me something? 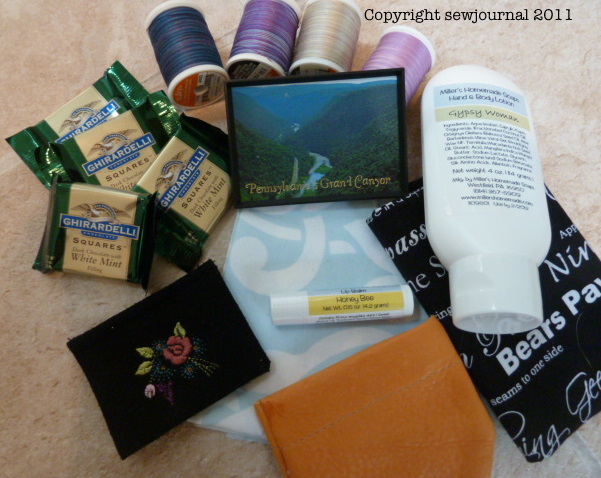 LOL And some “Honey Bee” lip balm, a fat quarter of text fabric with the names of quilt blocks on it and, did you notice the fat quarter of the fabric I was using in my Lily Wall hanging and that I was looking for more of? 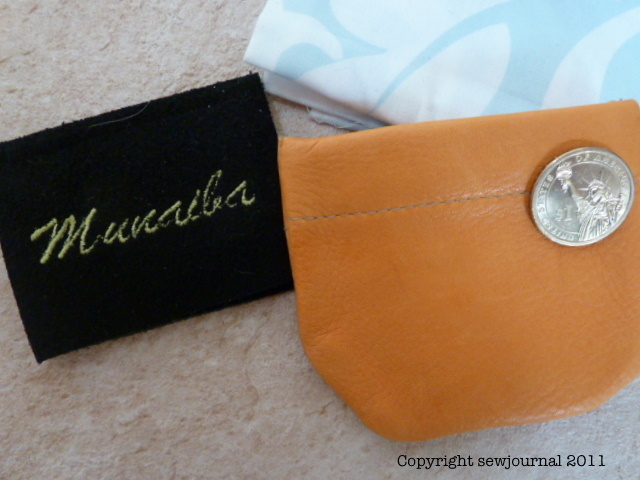 The needle case has my name embroidered on it and the coin purse has a US dollar coin in it. How wonderful to get some gifties! Sylvia is a wonderful friend. I knew there was a reason I liked you….dark chocolate is my favorite, too!! I love Ghirardelli, and my personal favorite is the dark chocolate with Raspberry filling….yum…8-) I noticed right away that she had sent you some of the fabric you were looking for. I searched online but had no luck. Isn’t it wonderful to get lots of little gifts?! I’d rather get several little ones, rather than one big one. Take care and know I miss you! Not sure what you mean about the fabric. That blue on white is the fabric I have that I was looking for. Thanks for telling me the story behind the presents , especially the needle case which is very special! awww, how wonderful to get such thoughtful and lovely gifts! And to get to read about them just makes me feel all fuzzy warm inside!